Some of Qing Rui's art was handcopied in tablature preserved within the Rong family. In addition, in 1870 Qing Rui himself produced a Handbook for Playing Qin and Se Together (琴瑟合譜 Qinse Hepu);15 its eight qin melodies with se accompaniment are listed in Appendix I below. As for other qin players in Guangzhou outside Qing Rui's family but considered to have been his students, one of these, 孫寶 Sun Bao, compiled 以六正五之齋琴學秘書 Yi Liu Zheng Wuzhizhai Qinxue Mishu (1875). Its contents are listed in Appendix II below. Of its 21 pieces, six are the same titles as pieces in Qinse Hepu, but with mostly different versions of those melodies. In Guangzhou Qing Rui also made friends in the local Lingnan school. He thus became familiar with their signature handbook, Wuxue Shanfang Qinpu (1836), as well as with the rather speculative Gugang Yipu, a handbook said to have preserved ancient melodies brought to the Pearl River delta at the end of the Song dynasty. However, he and is descendants continued to consider themselves to be Guangling School. ....At times at his Dream Fragrance Garden he would play se while his house guest Zhou Zhuling played qin. Guests who heard this all praised its beauty. The middle part, not yet translated, mostly concerns se. Style name 有年 Younian, nickname 輝山 Huishan. In addition to the Qin Shi Xu biography above, primary available reference materials are the biographical essay by Tong Kin-Woon in his Qin Fu and materials in Hammond Yung's 香江容氏琴譜 Xiangjiang Rongshi Qinpu. 9 lines; the source given is Chunhu Manlu. 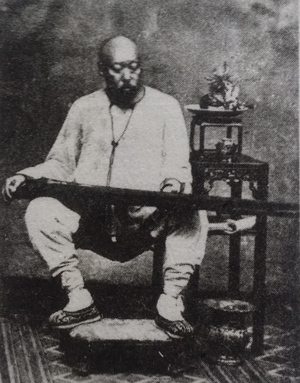 A copy of this photo was included with the essay about Qing Rui in Tong Kin-Woon's Qin Fu. Some of the melodies included in 香江容氏琴譜 Xiangjiang Rongshi Qinpu are attributed to Li Chengyu. No further information as yet other than that he was a 廣陵派 Guangling School qin player living in Hangzhou. This school (see in chart) was founded in Yangzhou at the beginning of the Qing dynasty by Xu Changyu and others. Haikang is basically the peninsula in southern Guangdong province facing Hainan island (which may at that time have been included in its jurisdiction). She taught Qing Rui's son and grandson. See further above. In addition to 晉齋孫寶 Sun Bao did this later. Did this later include Ye Shimeng? His recordings with the 2015 publication come from previously published ones such as this one. Hammond, who learned qin from his father 容思澤 Yong Sze-chak, actively teaches today. He has several recordings posted on YouTube (go to the site) and in 2015 published Xiangjiang Rongshi Qinpu (further below). In 2015 容克智 Hammond Yong published this handbook, which has three folios in traditional binding. The title might be translated as the Rong Family Qin Handbook from Xiangjiang ("Fragrant River"), a new name that evokes Hong Kong's connection to the Pearl River and hence Guangzhou (Canton). The Rong Family Tradition of qin play is generally referred to as 容氏家族 Rongshi Jiazu. In addition to a number of essays this handbook includes tablature for 33 melodies taught from this lineage (below). Some of them come from old family scores going back to Qing Rui himself; others can be found in handbooks such as those mentioned in Appendices I and II. There is also a DVD with 19 of the 33 tablatured melodies on 34 tracks (15 of the melodies are each recorded first by Yong Sze-chak then by Hammond himself, making 30 tracks in all; on the remaining four tracks Hammond plays three pieces and his father one). The recordings by Yong Sze-chak, made between 1986 and 1995, all use metal strings. Hammond's recordings were all made in 2014 using silk strings, to which he had recently returned. 1. 猗蘭 Yi Lan 1. YHC p.15: "李成宇先生授 given by teacher Li Chengyu". 3. YHC p.19: "李成宇先生授 given by teacher Li Chengyu". 5. 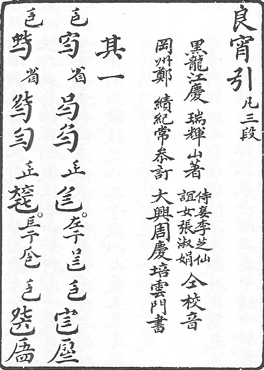 YHC p.24: "韓子十耕原搞 originally copied out by Master Han Shigeng"
7. YHC p.29: "李成宇先生授譜 tablature given by teacher Li Chengyu"
9. YHC p.34: "李成宇先生授譜 tablature given by teacher Li Chengyu"
p.37: ”參訂古譜 examined old tablature" but same (though adding comments) as 1836, which says "from Gugang Yipu". Also almost same as 1677. 11. YHC p.39: "李成宇先生授譜 tablature given by teacher Li Chengyu"
16. YHC p.52: "孫西耘道兄授譜 tablature given by (Qing Rui's) friend Sun Xiyun"; title and music as in 1836 but afterword is different. Usually called 圯橋進履 Yiqiao Jin Lü; 汜 si = (name of ?) stream. 23. YHC p.63: "參訂古譜 examined old tablature", but same as 1836, which says "from Gugang Yipu". Actually almost same as 1677. 25. YHC p.65: "古岡遺譜 Gugang Yipu"; 1836. 16. 雙鶴聽泉 Shuang He Ting Quan None p.68: "參訂古譜 examined old tablature", but same as 1836, which says "from Gugang Yipu". 18. 神化引 Shenhua Yin None p.74: "參訂古譜 examined old tablature", but same as 1836 (adding comments), which says "from Gugang Yipu". 19. 懷古 Huai Gu None p.77: "古岡遺譜 Gugang Yipu"; 1836. 27. 岳陽三醉 Yueyang San Zui None p.108: "武林李氏訂 fixed by Mr. Li of Wulin"
This was a villa in Guangzhou belonging to 鄭績 Zheng Ji, a well-known local painter who wrote a foreword for 琴瑟合譜 Qin Se He Pu. The melody in the image is Liangxiao Yin, the first melody in the handbook. The text accompanying the melody mentions Qing Rui, his concubine Li Zhixian and a friend. As for the music itself, the first line has the se part, the second line is the corresponding qin melody. Both begin in harmonics, but it is not clear what "harmonics" is meant when playing the se. The ornament in the se part apparently has to do with left hand vibrato to the left of the moveable bridge. The front page says this handbook is "長安市上彈無絃琴者晉齋孫寶草創 a rough copy by Sun Bao, nicknamed Sun Jinzhai, player of a stringless qin in Chang'an Town". Sun, born in 1819, is said to have been a student of Qing Rui and Qing Rui's teacher Li Chengyu. Of its 21 pieces, six are the same titles as in Qinse Hepu, a handbook compiled by Qing Rui himself, but with mostly different versions of those melodies. The pages with tablature are all marked Private Tablature for Qin Study (琴學秘譜 Qin Xue Mi Pu). The title is clearly a reference to the early Guangling School handbook Wuzhizhai Qinpu (1722).